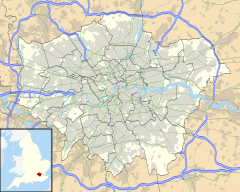 Harlesden /ˈhɑːrlzdən/ is an area in the London Borough of Brent, northwest London. Its main focal point is the Jubilee Clock which commemorates Queen Victoria's Golden Jubilee. Harlesden has been praised for its vibrant Caribbean culture and unofficially named London's reggae capital. The population includes people of Afro-Caribbean heritage, as well as Irish, Portuguese, Brazilian and smaller Latin Americans and East African groups within the community. The image of Harlesden today began to take shape in the 1950s, 1960s and 1970s. Continued immigration from Ireland and new immigration from the Caribbean, the Indian sub-continent and Africa changed the racial and cultural make up of the area. More recently the area has become home to Brazilian and Portuguese communities. In 2011, 71.4% of homes were apartments across the ward, 15.8% of homes were terraced houses, 8.6% semi-detached houses and 4% detached houses; with 0.1% of the homes mobile or temporary structures. Most of the terraces are pre-1920s and the flats converted from them. Many of the flats date to after the year 2000. Non-mixed use terraces and private sector built apartments are the main housing types that attract high prices from private sector owner-occupiers unable to afford similar properties in nearby Kensal Green and Queen's Park. Starting in 1999, Harlesden and the nearby Stonebridge estate, witnessed a high number of murders and became a crime hotspot, because of several rival yardie gangs. During this time Harlesden turned into one of London's main crack cocaine trading centres, and one of the yardies' strongholds. By 2001 the area had the highest murder rate in Britain. There were 26 shooting incidents that year alone. Crime rates were significantly reduced in the late 2000s. ^ Staff, Guardian (1999-07-18). "Yardie terror grips London". The Guardian. ^ "Murders rising in 'Yardie' drug war". 1999-07-06. ^ "BBC News | UK | Police tackle London's Yardies". ^ "Harlesden traders attacked as looters attempt to storm their shops". ^ "17 injured after bus smashes into shop in Harlesden". 2016-05-15. ^ "At least 17 injured in London bus crash". BBC News. 2016-05-15. ^ "Harlesden - UK Census Data 2011".